Chinese New Years — Come celebrate to bring in the 1st day of the Chinese New Year on February 5th. 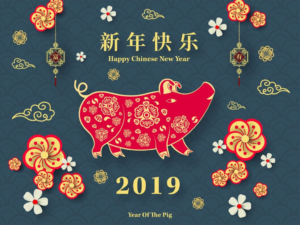 Were you born in the Year of the Pig? What goes on during the celebration which lasts for 8 days? This will all be explained in a very personal presentation by your Director at The Mews and will include an introduction to Chinese language and culture. This will be followed by a Chinese Feast in the Dining Room prepared by the great Kitchen Staff! Join Darby on February 22nd for a another celebration of the New Year!